Adding fresh fruit and vegetable purees to cold process soap has long been a staple in the soapmaking community. 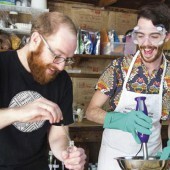 Purees can add color and skin-loving properties to the bar. In addition, purees are great from a marketing standpoint. 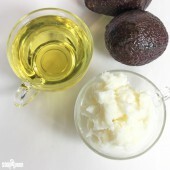 One of my favorite purees for cold process soap is avocado. 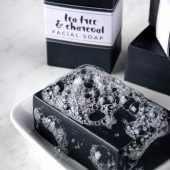 It gives the soap a luxurious feeling. Unlike some additives, avocados do not contain a large amount of sugar. Adding sugars (like those found in fruit) to cold process soap can cause excess heat, which can make the soap difficult to work with. 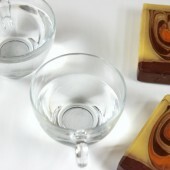 For example, adding honey can cause an extreme gel phase, as seen in the Adding Honey to Cold Process Soap blog post. 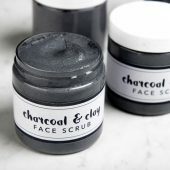 For this recipe, I added a full 3 ounces of avocado pulp, in addition to French green clay and spirulina powder for color. 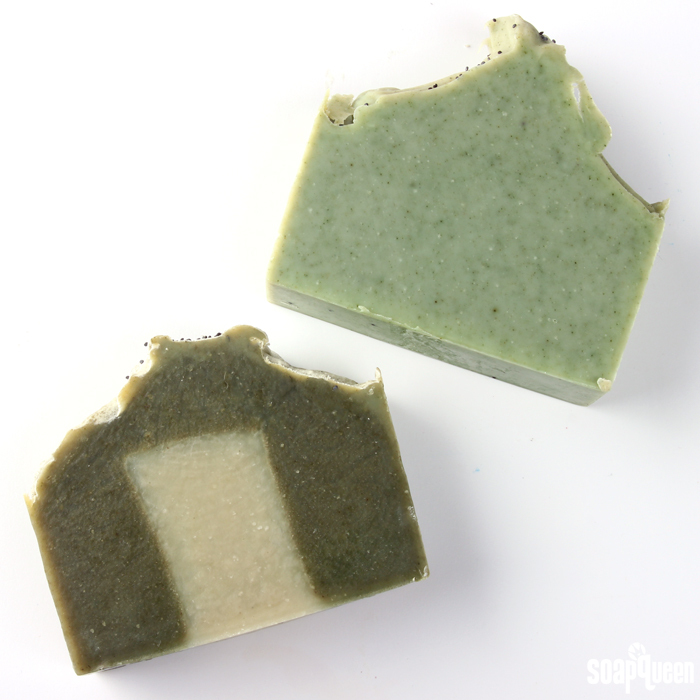 Spearmint essential oil gives these bars a crisp and refreshing scent. 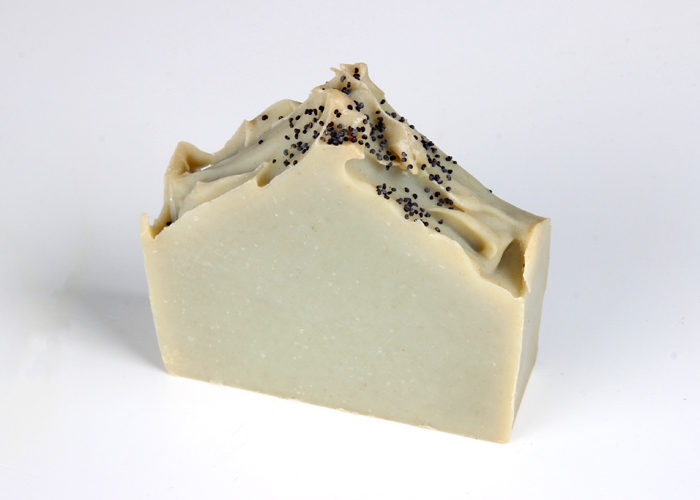 After achieving a nice thick texture, I mounded the top of the soap toward the center, created texture and sprinkled poppy seeds on top for decoration. I decided to place this soap into the fridge to prevent gel phase. 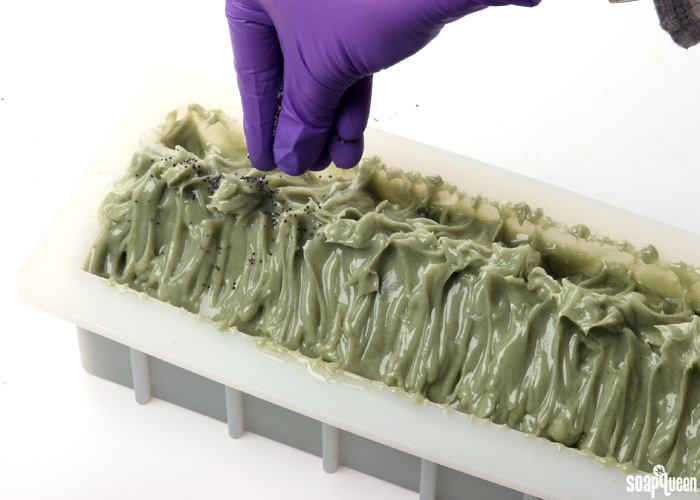 The additional water from the avocado and clay + heat causes glycerin rivers. Believe me…it happened! 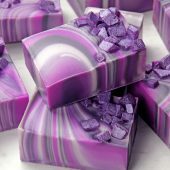 You can see my first batch of this soap without a water discount and after gel phase at the bottom of this tutorial. Learn more about glycerin rivers and how to prevent them in this post. After making this soap, I was perusing the #SoapShare hashtag on Instagram (one of my favorite ways to spend precious downtime) I stumbled upon this beautiful Listea Poppyseed Mead Sea Mud Soap by sassy_soaps_and_such. I was shocked how similar the two designs were. Isn’t it crazy how that happens sometimes? I love Rhonda’s spin on a similar idea, with a layer on the bottom. Great minds really do think alike! This recipe does contain a water discount to take into consideration the extra water that is added to the recipe. This recipe adds water in three different ways. 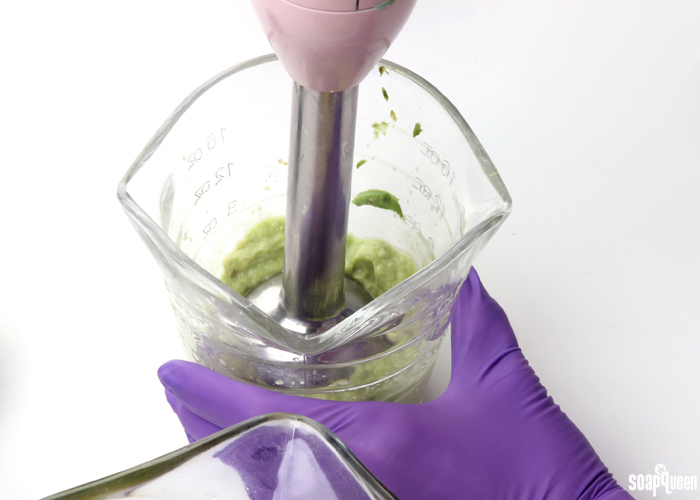 First, 1.5 ounces of water is added to create the avocado puree. Then 2 Tbs. (about 1 ounce) of water is added to the clay to help create a dispersion. In addition, the avocado itself contains water. It’s tricky to know for sure how much water the 3 ounces of avocado contains, so I estimated about .5 ounces. That’s a total of 3 ounces of added water. The full amount of water in this recipe is 11.5 ounces. To get the amount below, I subtracted the 3 ounces which is 8.5 and used a water discount of 15% which is 7.2 ounces. With the added water, that’s a water discount of about 11% (7.2 ounces + 3 = 10.2). Note: This recipe has a 3% superfat to compensate for the added oils in the avocado. It also has a large water discount to compensate from the water in the avocado puree and the clay dispersion. 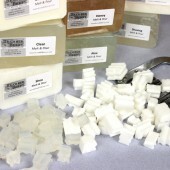 If you’ve never made Cold Process soap before, stop here! 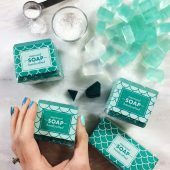 I highly recommend checking out our FREE four part SoapQueen.tv series on Cold Process Soapmaking, especially the episode on lye safety. 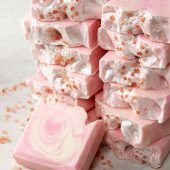 And if you’d rather do some reading, Bramble Berry carries a wide range of books on the topic, including my newest book, Soap Crafting. You can also checkout the digital downloads for that instant gratification factor. COLOR PREP: Disperse 1 tablespoon of the spirulina powder into 1 tablespoon lightweight liquid oil such as sunflower or sweet almond oil. Use a mini mixer to get rid of any clumps. Then mix 1 tablespoon French green clay into 2 tablespoons distilled water. The mixture will become quite thick. Clay is dispersed in water due to help avoid cracking due to the clay’s tendency to absorb moisture. 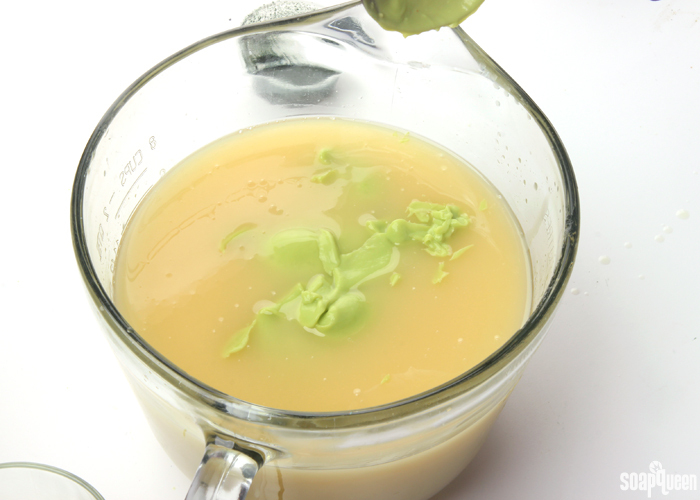 PUREE PREP: In a small container, measure out the 3 ounces of fresh avocado pulp (no skin). 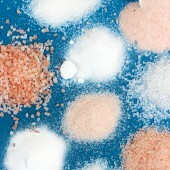 Add 1.5 ounces of distilled water, and use a stick blender, food processor or blender to blend until smooth. Set aside. ONE: Slowly and carefully add the lye to the water and gently stir until the lye has fully dissolved and the liquid is clear. Set aside to cool. TWO: Melt and combine the coconut oil, avocado oil, avocado butter, olive oil, castor oil and palm oils (remember to fully melt then mix your entire container of palm oil before portioning). 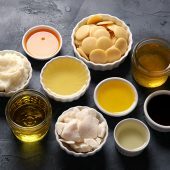 Once the lye water and the oils have cooled to 110-120 degrees or below (and are ideally within 10 degrees of each other), add the lye water to the oils and stick blend until thin trace. If you’d like a harder bar of soap that releases faster from the mold, you can add sodium lactate to the cooled lye water. Use 1 teaspoon of sodium lactate per pound of oils in the recipe. For this recipe, you’d add about 2 teaspoons sodium lactate. 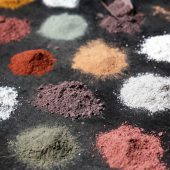 THREE: Once the mixture has reached a thin trace, add the avocado puree, all the dispersed spirulina powder and all the dispersed French green clay. FOUR: Stick blend the additives into the soap until completely smooth. Add the spearmint essential oil, and stick blend using short pulses until incorporated. You don’t need to worry too much about the batter becoming thick. In fact, you want a nice thick trace! But, the soap still needs to be workable. FIVE: Pour all the batter into the mold, concentrating the batter in the center. 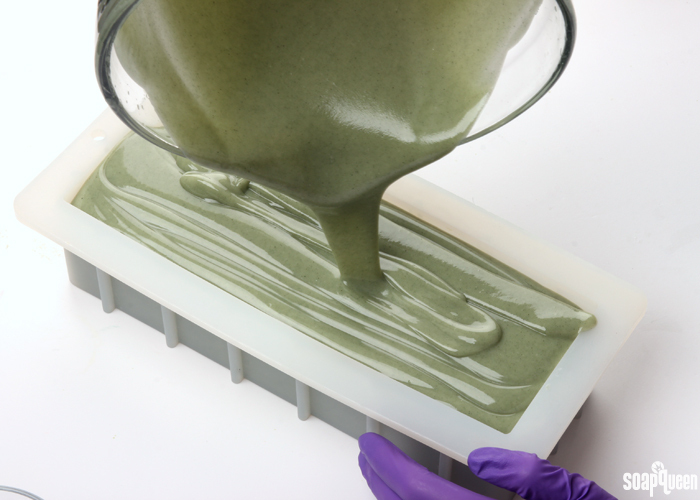 SIX: Use a spoon or spatula to begin mounding the soap batter into the center of the mold, creating a peak. If the soap is not thick enough to hold a shape, allow it to sit for several minutes to firm up slightly. Continue to build the soap in the center until you’ve created a large peak. 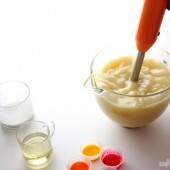 SEVEN: Once you’re happy with the height of the soap, use the side of a spoon to create divots/texture into the peaks. You could also use a fork for this step. There is no right or wrong way to do this, just keep playing with the soap until you’re happy with the look. EIGHT: Once you’re happy with the top, sprinkle poppy seeds in the center of the peak. Spritz the top of the soap with 99% isopropyl alcohol to avoid soda ash. Then, place the soap in the fridge (or freezer) for 4-24 hours. Doing so will help prevent gel phase and glycerin rivers. If you soaped at slightly higher temperatures I would recommend placing it in the freezer. 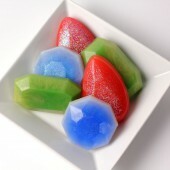 Remove from the fridge or freezer and allow the soap to harden in the mold at room temperature for 3-4 days. Unmold, and cut into bars. Allow to cure for 4-6 weeks. Below is an example of this recipe gelled vs. un-gelled. The soap in the top right is the soap shown in this tutorial, which was placed in the fridge. The soap in the bottom left is the same recipe without a water discount, and the soap was insulated to promote gel phase. 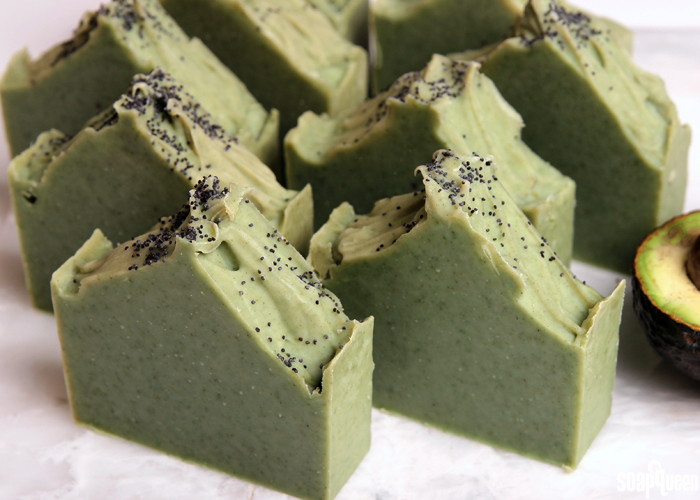 The first time I made this soap, I insulated the soap because I wanted the spirulina to be vibrant. But, I ended up with glycerin rivers. The color is fine, but I actually prefer the lighter shade on top. Of course this is just personal preference, and both soaps will feel fantastic. The soap in the top right was placed in the fridge to keep cool, while the soap on the bottom left was insulated and went through gel phase. UPDATE 7/6/2016: Below is a photo of the soap, almost exactly 5 months after being made. As you can see, the green has faded to a very light shade. This soap was not exposed to light, and stored in a cool, dry place. 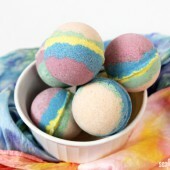 Unfortunately, there is not a way to prevent the colorants from fading. 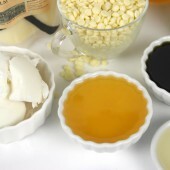 Have you used purees in cold process soap before? If you’re looking for ideas, my new book Pure Soapmaking has several recipes using purees, including tomato, cucumber and more! 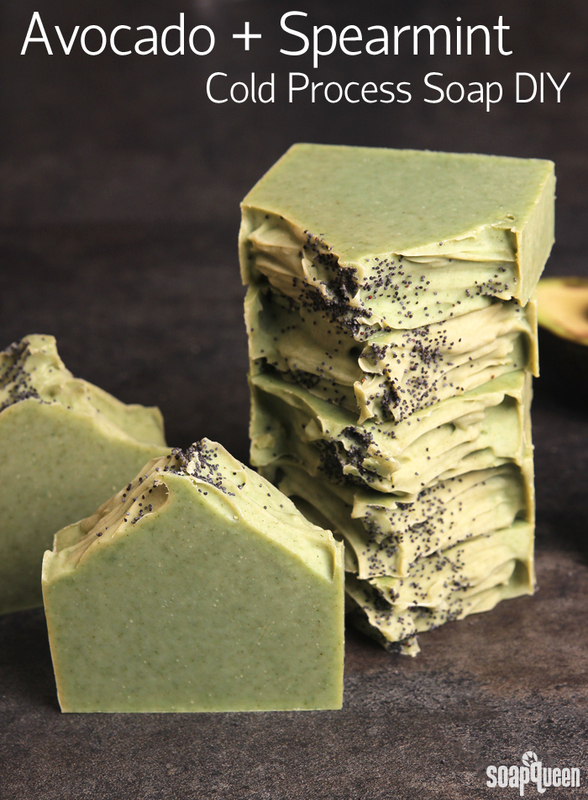 This project uses real avocado for skin loving properties, along with spearmint essential oil for a crisp scent. 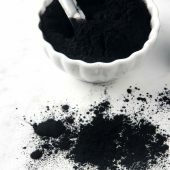 COLOR PREP: Disperse 1 tablespoon of the spirulina powder into 1 tablespoon lightweight liquid oil such as sunflower or sweet almond oil. Use a mini mixer to get rid of any clumps. Then disperse 1 tablespoon French green clay into 2 tablespoons distilled water; the mixture will become quite thick. 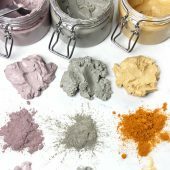 Clay is dispersed in water due to help avoid cracking due to the clay's tendency to absorb moisture. Slowly and carefully add the lye to the water and gently stir until the lye has fully dissolved and the liquid is clear. Set aside to cool. 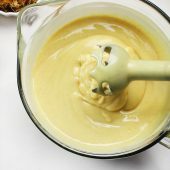 Melt and combine the coconut oil, avocado oil, avocado butter, olive oil, castor oil and palm oils (remember to fully melt then mix your entire container of palm oil before portioning). 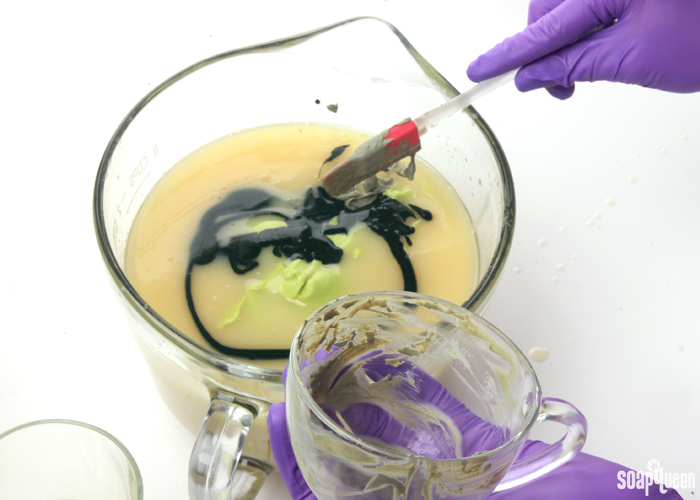 Once the lye water and the oils have cooled to 120 degrees or below (and are ideally within 10 degrees of each other), add the lye water to the oils and stick blend until thin trace. If you’d like a harder bar of soap that releases faster from the mold, you can add sodium lactate to the cooled lye water. Use 1 teaspoon of sodium lactate per pound of oils in the recipe. For this recipe, you’d add about 2 teaspoons sodium lactate. 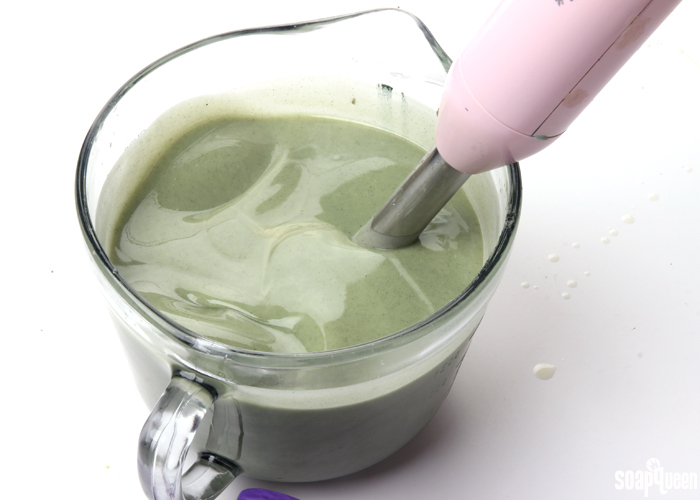 Once the mixture has reached a thin trace, add the avocado puree, all the dispersed spirulina powder and all the dispersed French Green Clay. Stick blend the additives into the soap until completely smooth. 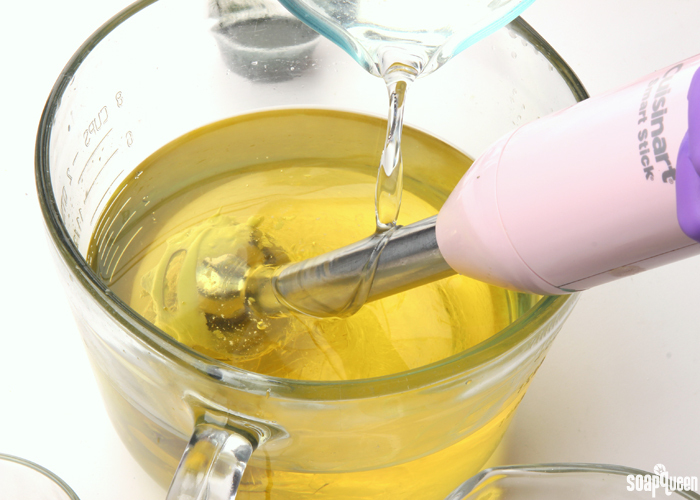 Add the spearmint essential oil, and stick blend using short pulses until incorporated. You don’t need to worry too much about the batter becoming thick. In fact, you want a nice thick trace! But, the soap still needs to be workable. Pour all the batter into the mold, concentrating the batter in the center. Use a spoon or spatula to begin mounding the soap batter into the center. 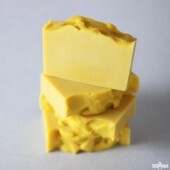 If the soap is not thick enough to hold a shape, allow it to sit for several minutes to firm up slightly. Continue to build the soap in the center until you’ve created a large peak. Once you’re happy with the height of the soap, use the side of a spoon to create divots/texture into the peaks. There is no right or wrong way to do this, just keep playing with the soap until you’re happy with the look. Once you’re happy with the top, sprinkle poppy seeds in the center of the peak. Spritz the top of the soap with 99% isopropyl alcohol to avoid soda ash. Then, place the soap in the fridge or freezer for 4-24 hours. Doing so will help prevent gel phase and glycerin rivers. 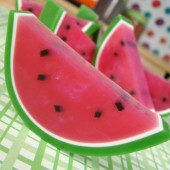 Remove from the fridge and allow the soap to harden in the mold at room temperature for 3-4 days. Unmold, and cut into bars. Previous Post: Cold Process Soap Swap 2016: Sign Up Now! 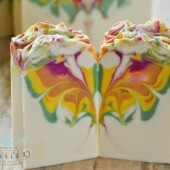 I would love to try this soap! 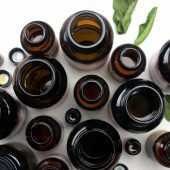 I want to do a spearmint or peppermint soap for the holidays, however, I have heard/read a lot about many essential oil’s fragrance tend to fade or even dissappear completely in cold process soap, how did/does the spearmint fragrance hold up? Any suggestions about how I’d be able to anchor the scent so it doesn’t fade? Spearmint and peppermint are quite strong, so you don’t have to worry about them fading. 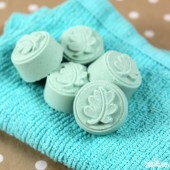 They smell sweet and minty and you only need a little bit in your soap to make an impact. Thank you very much for the answer! It is much appreciated! I’m a new soaper and want to substitute the Palm in this recipe. Any ideas of what to use? 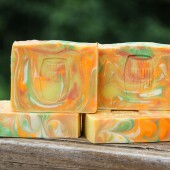 Palm oil adds some great firmness to your soap, and there is no direct replacement for it. You can add certain oils and butters to help firm your soap up though. 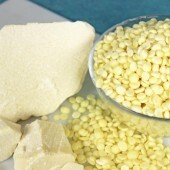 For instance, adding a hard butter, like cocoa butter up to 15%, can harden the bars. You can also add coconut oil or tallow up to 33%. 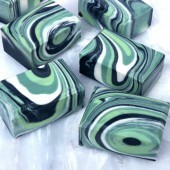 I’m thinking of using spinach as a colorant for my cold process soap recipe. Have you had experience using spinach? 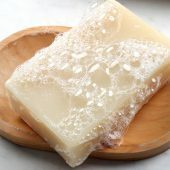 I thought about pureeing it and using a cheese cloth to get drain the water and use the green water as the my lye water. We haven’t done a lot of testing with spinach but you can give it a try. I’m thinking it may turn brown, so it’s definitely worth a small test batch. You may want to try the puree and spinach powder to see if one works better. do you have a similar recipe for melt and pour? 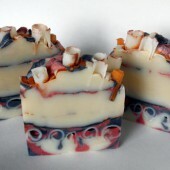 I just made this soap last night, and added the lye water to the oils at about 110°f. Of course I leave the sodium lactate out and didn’t realize until it was already in the mold. I took it out of the fridge this morning and it still feels really soft, especially the corners. I’m getting kind of worried. It hasn’t been 24 hours yet, so I’ll give it 48 before I call it a loss. It’s also really warm in my soaping room. I’m hoping if I post my altered recipe you might be able to help me understand where I might have gone wrong? I gave it a 11% water discount, and added 3oz of avocado plus 1oz of water. I added 1tsp of green oxide, 1tsp of allantoin powder and used 2tbs of olive oil from the recipe to disperse. 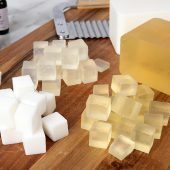 That is totally normal – soap usually takes about 3-5 days to come out of the mold, especially with a palm-free recipe with lots of soft oils. Castor oil especially can make that soap feel softer. I would recommend waiting about 4 days, then testing the soap. If it’s still too soft, let it sit a few more days and try again. I made this soap last 3 days ago and just cut it. I followed the instructions and I put the mold in the fridge for 6 hours after pouring. The outside looks amazing and it smells great but when I cut it, I have dark large circles in the center of each piece indicating it went through gel phase. What else can I do to prevent this from happening? It can help to keep the soap in the freezer for a full 24 hours. 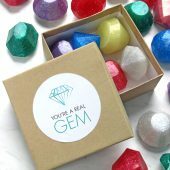 You may find a gel ring happens even then (vegetables can be tricky in soap), but it should be smaller or not noticeable if it’s kept in the freezer longer. Thanks. I’ll try that next time. I love how it smells and I’m sure it will be lovely in the shower. Would EDTA prevent colors to fade? I had a question. 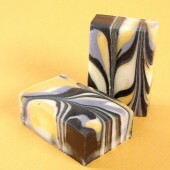 I am making a variation of this soap and I have used a lye calculator to calculate it. I am making 32.41 oz. of soap containing: 3.15 oz. of lye and it says 7.26 oz. of water. If I just add 6.26 oz. of water with the lye and take out one oz. for my avocado puree that I will add at the end will that work? Yep, that sounds just fine. That will prevent the soap from getting too wet. I love your site! I’ve been soaping for 3 months and you have helped me a bunch. I’ve made this recipe and got a gel ring and I really liked the color. Do you think it would be ok if I just insulated the next batch and encouraged a gel? Seems like that might be easier than trying to prevent one. If it is getting too hot, pop it in the fridge or freezer for 5-24 hours. What are the benefits of adding pureed fruit and vegetables? 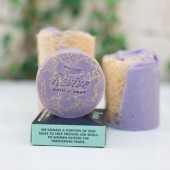 Will it make my skin softer and not so dried feeling after using soap? Hello. 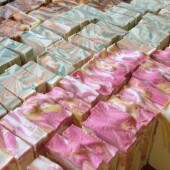 Iam newer to soap making and have made several soaps with natural colorants that have been dispersed and have never done a water discount. My question is what happens if you dont do a water discount on this recipe? Also I only have spirulina, not the clay, so how do you think it will effect the color of my soap? Thanks so much! How well/long does the spearmint hold up as the sole EO? Why no Sodium Lactate in this recipe? Also, how do I convert this recipe to 5 pounds? 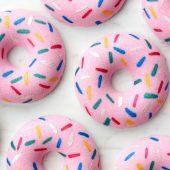 Is there a tutorial for resizing recipes? Please disregard my question about the French green clay. I found the answer. Chemo brain. Yup. So sorry. 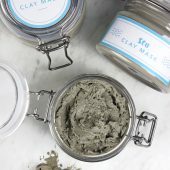 I’m wondering how much french green clay is used in this recipe (with how much water)? 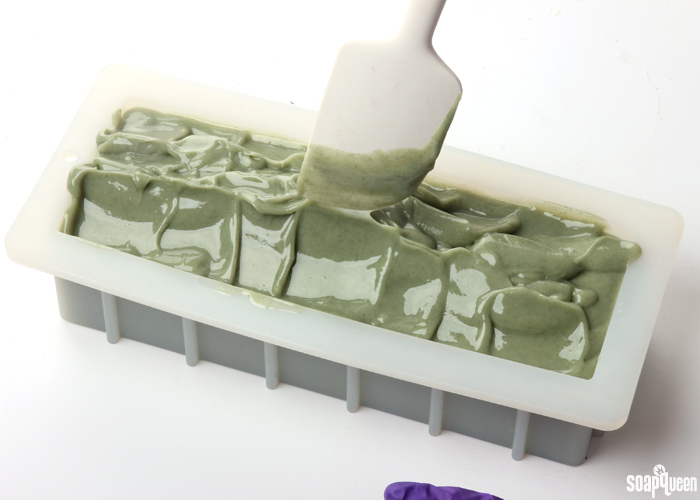 Without the spirulina, this soap will be a lighter grayish/green color. It will look a lot like the soap pictured above that’s 5 months old. If you want a bit brighter green, you can add Green Chrome Oxide. I would recommend mixing 1 teaspoon of the Green Chrome into 1 tablespoon of lightweight oil, then add that 1 dispersed teaspoon at a time until you get a color you like. Can you still use this same recipe, but substitute the avocado puree for say, pumpkin puree, tomato puree, etc and still keep the same water discount? 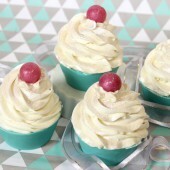 You can use other purees in this recipe! Each vegetable has a different water content, so it may need a slightly different discount. For instance, pumpkin puree and avocado puree have a similar water content. Cucumber, on the other hand, has a high water content. So, you may need to increase the discount to 15% to account for that water! What would be the conversions for the recipe to fit the 5 lb mold? We have updated the Lye Calculator since that post. It looks a bit different, but it works the same way! You say, “per pound of soap”, does it mean per pound of oils + lye water? Thank you! 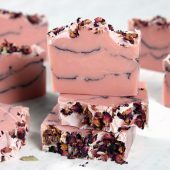 I really want to make this soap but my mold only holds about 30 oz and since I haven’t gotten into water discounting yet I can’t figure out the water amount for the 30 oz. Can someone help me out? Thanks Kelsey I just figured it out how much water I need. It’s pretty easy once you know how! But just curious, how did you come up with the numbers for the amount of avocado and water? Also, I use soapcalc, do I need to change the water percentage to oils from 38% to a lower percentage? I superfatted at 3% (like in the recipe) so I changed it (on soapcalc) from the normal 5% correct? Sorry for all these questions! Kelsey, I just used BB’s calculator and the water amt was almost the same as what I figured out from your directions so I used that and it’s printing. Still curious about the numbers for the avocado and .5 distilled water! 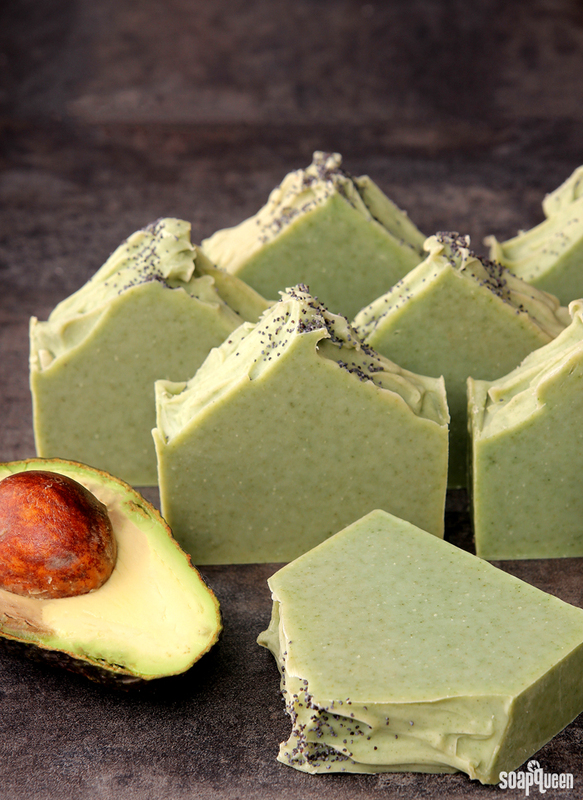 Adding the avocado and water to the soap will add extra water. To keep the soap from getting too wet, we subtracted that avocado amount (we estimated about 3 ounces) from the main water amount. Then, we discounted that number (11.5-3=8.5) by 15%. That will help account for any excess water and prevent glycerin rivers! I made this soap about 3 – 4 weeks ago. People are still coming into my house and saying, “Gee, it smells like gum in here … or minty!” The fragrance is amazing!!! I soaped at the lower temps (100-110) and put mine in the freezer for 24 hours. I have a very cold freezer that turns ice cream into cement and still got a small gel ring. Does it bother me? Not one bit. I had to test a bar this morning and I absolutely love it. I’m not looking at that little gel ring when I’m in the shower. I just love this soap. Thanks again, Brambleberry!!! Same thing happened to me…The soap is absolutely gorgeous though I soaped at 105 F and still got a gel ring…. Should I consider maybe soaping at a lower temperature? even room temperature….. ? Thanks for your help! The rectangle in the photo is actually a design we did intentionally! 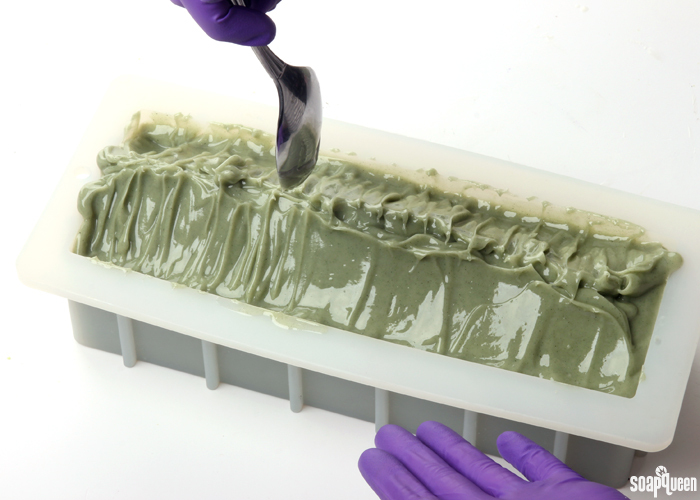 We used our Multi-Pour Sectioning Tool for the 10″ Silicone Loaf Mold and poured some white soap in the middle. Sorry for any confusion! I love this soap! I’ve been wanting to add avocado to a batch but am always afraid that it would accelerate trace too much but I’m definitely going to try it now. My “twin in-the-mold soap to yours” is an awesome bar that I’ve been using on my face. I love the dead sea mud!! 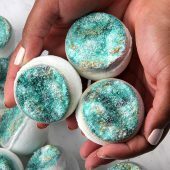 Its amazing that as much as they looked alike in the mold they had totally different ingredients and the spearmint eo you used has got to smell awesome!! Thanks so much for the tutorial and the link to my soap! 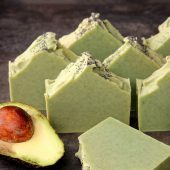 I absolutely love the look and components of this soap, especially the avocado and I love avocado! I'm new to soapmaking and have made a few batches of the Back to Basics- Simple and Gentle CP soap with different FOs and some were successful and some not. Still, it hasn't stopped me from making soap! I was wondering if there are any other butter substitute I can use besides the AB? I live in Malaysia and I've not found a store that sells it. Also, is it possible to use half of the amount of Avocado oil and use Sweet Almond oil for the other half? I have a few question’s about this recipe. First thing this recipe looks so easy to make and is gorgeous!!!! 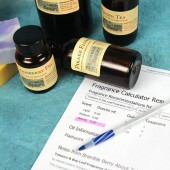 But anyway, can I make this recipe without a fragrance of EO? 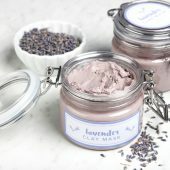 My husband and I have sensitive skin and are skin can’t handle fragrances and EO so I would like to leave it out, but if I do leave it out do I have to change anything in the recipe? And the other question is how is the feel of this bar soap ( is it not drying to the skin ) also does this lather well? I can’t wait to make this, and give some away!!! These bars feel great on the skin. 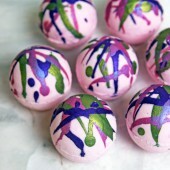 The avocado puree gives them a creamy, luxurious feeling, and the castor oil gives them a really nice lather. I can’t wait for you to give them a try! 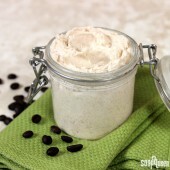 I’m so excited about this recipe because it looks like it would be a nice simple recipe, plus good for sensitive skin!!! I forgot to ask about the bowl she used for this recipe, can I buy a 2 quart bowl from bramble berry? Also I read in another web site that you can put the lye water into the oils when the temperature goes down to 90 degrees? After reading about gel phase, I thought that it might be better to pour the lye water in at 90 degrees instead of 110? And another question, how long does it usually take for the lye water to cool down ( hours, minutes)? We like to have our lye and oils between 100-130F. We typically soap right around 115-120F. We find those temperatures work well because everything stays nice and melted and you have some time to work. You may find different temperatures work for you, but starting at 120F is a good idea! I made this over the weekend. I used the gift White Rose fragrance i git from you. Smells lovely and made my house smell nice. One thing that came out weird, though. I took your advice and put the soap in the freezer, and it still looks like I git a tiny ring of gel….how do you control that? Thank you, glad you love the recipes! If the soap is quite hot, it can gel a little bit, even in the freezer. To prevent that, I would recommend lowering your lye and oil temperatures to around 110-120F. Then, keep that soap in the freezer for 24 hours. That should keep it nice and cool and prevent that ring. I also got put mine in the freezer but still got that dang ring! I will make sure that my lye water is cooler next time. 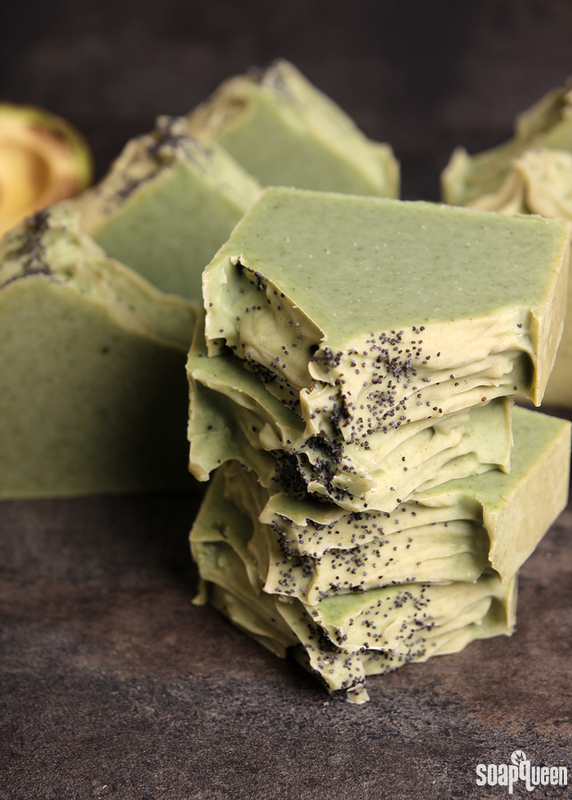 Not exactly the same- made it with a slightly different recipe, in a 5lb mold, with poppy seeds throughout, I did use Spirulina and Avocado, no clay, and for fragrance I used 50:50 mix of Spearmint EO and Sweet Grass FO. And I got to tell you, that combination is wonderful!! just made this soap. used the free “white rose”fragrance I got with my last order. Yummy!!! have to say one of the things i love about making soap is how nice the house smells afterwards. and i use the left-over soap to mop my floors. nice smell plus a bit extra fat on my tiles…nice. now I can’t wait to see how it comes out. i put it in the freezer to prevent gelling. i had a somewhat over exuberant gel phase with my neem oil soap…. Hi! I love your blog. 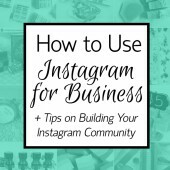 Great resource for inspiration. 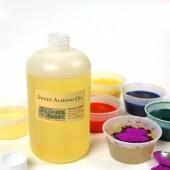 I also order most of my soaping supplies from Bramble Berry. 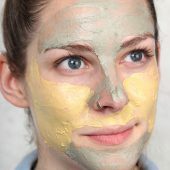 I have a question about labeling soap “Avocado + Spearmint” with the ingredient Avocado having used in the soap. 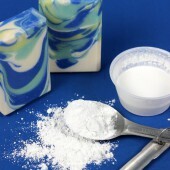 By soap government guidelines can a soap be named with the ingredient that was used in it? 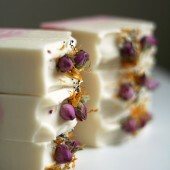 Another example: “Rose Clay Soap”. Also…in this in this tutorial the description about adding avocado says it has “skin-loving properties”. Is this a phrase we can use in our descriptions on the soaps we sell? 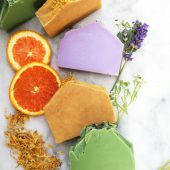 I just read the other article from a few days ago “A Surprise Visit from the FDA” on the rules and regulations when describing what a soap will do for your skin. Thank you so much, glad you love the blog! In Marie Gale’s book, Soap and Cosmetic Labeling, she says if the name of a product has one of the ingredients – like avocado – it may be mislabeled. 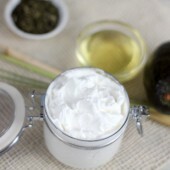 For instance, if you say “Shea Butter Lotion,” it can be misleading as the lotion has more than just shea butter. 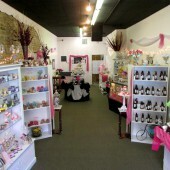 That being said, there are lots of companies (small and big) that say cocoa butter lotion, silk handmade soap, etc. So, it is a bit of a gray area. To be on the safe side, you can leave the ingredients out of the title. 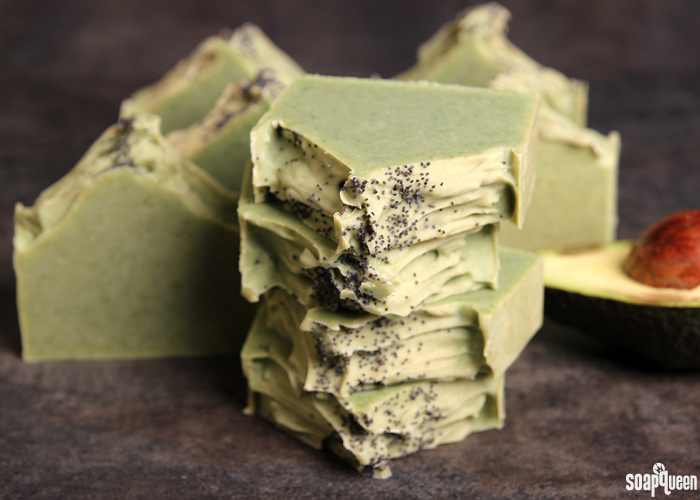 You can also say something like, Handmade Soap with Avocado, that way they know avocado isn’t the only ingredient. 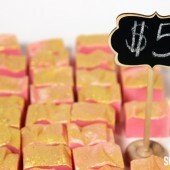 If you want to sell your soap as a cosmetic, skin-loving is fine to use! 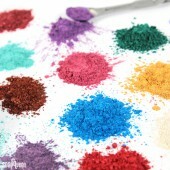 Cosmetics are intended to beautify or alter ones appearance. For instance, moisturizing, cleansing, etc. A drug, on the other hand, is intended for use in the diagnosis, cure, mitigation, treatment, or prevention of disease. So if your soap is labeled as a cure for acne, it will need to be tested and regulated as a drug. I purchased the lye calculator and it doesn’t let me calculate for essential oils. Thanks so much for your order! The Lye Calculator determines the amount of liquid and lye needed for your batch. It doesn’t have a section for fragrance or essential usage rates though. I’m looking to buy a wooden mold. what is the best size? I’m looking at a 2 or 4 lb. I can’t wait to try this recipe, it looks great! Thank you for sharing with us! I love the concept behind this one and think I may have to give it a go! 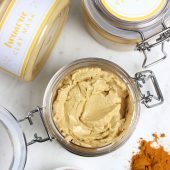 I’m very particular about what oils/fats/butters I use so I’ll have to re-work the recipe (I never ever use palm)… Do you think I could directly replace the palm oil with another like sunflower? I’m not sure if this converts the same or not, I’ll probably have to put it all into the lye calculator… Great tutorial though!! 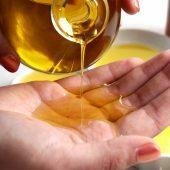 I, too, would like to know if I could substitute oils in this recipe! I would love to know if I could use one of your ready mixes with the avocado pulp. This is really awesome! I have one more suggestion, since you are working on the website. I think it would be nice if people could post a small picture of the finished product next to their review. I love seeing pictures and it would be helpful to see when someone talks about discoloration or acceleration, how it came out for them. I agree! What happened to that? I agree too. Also you might want to consider adding superfat up to 20%, not just 10%. And, in general, I don’t like the new look of the website much. We’re working on getting the percentages back on the Lye Calculator now! We are in the process of updating the website and working out any glitches, including the percentages. We are hoping to have everything back up and running soon. Sorry for any inconvenience.